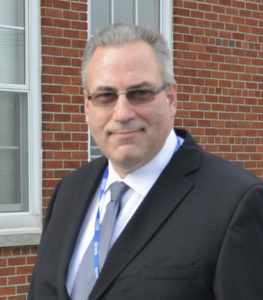 After two years leading the technology department in Schenectady City Schools, Peter Goodwin has returned to East Greenbush as the new Director of Technology. Mr. Goodwin, who taught at Red Mill Elementary School for 11 years, will supervise the Technology and Data Processing Departments, manage the district’s technology infrastructure, prepare each school for computer assessments, chair the District Technology Committee and maintain all hardware and software. We sat down with Mr. Goodwin this week to learn more about him and his new role. Q: How is the job going so far? A: The job is going great. It’s just like coming home. Q: Why did you want this job? A: This is the job I actually wanted when I made the decision to become an administrator, but it wasn’t available at the time. I have had many roles in the district. I’m a parent. Two of my kids just graduated from Columbia and one is in the middle school. I was a teacher for 11 years at Red Mill and I interned for two years before I got my administrative certification. So I’m able to look at the district with multiple lenses. When I got to the point in my teaching career where I thought I could be of service to other teachers and students in helping them with technology, that’s when I made the decision to become an administrator. Q: What are some of your goals as Director of Technology? A: To bring us to the point where the district is the finest in technology. I want us to have a full and wireless network and to meet the needs of all the students in an equitable manner. I feel like we can improve what we’re doing and I look forward to cooperating with all of our stakeholders – teachers, parents and students. Q: How do you think your experience as a teacher will help you in this role? A: I think it’s key. Having lived the life of a teacher and understanding the issues, especially how they relate to technology, that is going to inform my work. A: For school to start and the kids to return. It’s interesting because I’ve actually taught a fifth of the kids at the middle school and a fifth of the kids at the high school. I live in the community. It’s nice to see someone you’ve worked with or a family that you’ve spoken with and I enjoy those interactions. I look forward to reuniting with everyone. Q: What were some of your accomplishments in Schenectady? A: We did quite a bit. The district is in transition re-districting and has had many construction projects. So I oversaw the installation and operation of technical systems in those schools. I learned a lot. I will miss my friends at Schenectady. There were a lot of great people there, but it was time to come back home to East Greenbush. I feel very prepared based upon those experiences and to help East Greenbush with the upcoming capital project. Q: What will your role be with our Capital Project? A: I believe I’ll have input in the areas of technology. And I’ll be responsible for making sure it aligns with our Technology Plan, which should be finalized in the fall. Q: What has it been like to return to East Greenbush? A: It’s been a very happy experience for me. It’s a tremendous advantage to know that institutional history. I feel very much like I’m coming home. I look forward to working with the teachers, administrators, students and families to make this the best technology program that we can.